All Advertisements, including Want to Buy, Want to Sell, Want to Trade, Belong in the MARKETPLACE ONLY. Any new threads posted offering an item for sale, looking to trade or buy an item which are posted outside of Marketplace will be deleted without notice or warning. Existing threads will be moved to marketplace. I heard awhile ago that in Texas, there are so many wild hogs there is no limit to the amount you can shoot. They are a rampant pest. I'm wondering, here in AZ with some vacation time, how I could go about hunting a number of hogs in Texas or other states. I would like to help a farmer out, I don't have a ton of cash for a guided hunt. But I can go into the bush for a couple days with MRE's and kill some. Anybody got the hookup or other info? See my Balkans collection on my website http://partisanrifles.weebly.com/, specializing in rifles with soldier graffiti. Last edited by hairygreek; October 16, 2018 at 13:57. Giving people the benefit of the means it’s ok to screw you over. Expect the worst, and you'll never be disappointed. Before trying to beat the odds, make sure you can survive the odds beating you. I have not done it yet myself, but there are at least two places in TX (and at least one in FL) where you can shoot hogs from the side door of a helicopter. It is on my "to do list"
Last edited by Invictus77; October 16, 2018 at 14:34. Reason: Changed "to" to "two". I know how to spell but my typing sux. I have not done it yet myself, but there are at least to places in TX (and at least one in FL) where you can shoot hogs from the side door of a helicopter. I think it's on my bucket list now too. I have hunted hog in WV before. Hunting hogs from helicopters in Texas sounds like my idea of fun. Find More Posts by Raggedwhole! Texas has a funny way of "hunting". You pay a lot of money to be driven to a box on stands on some "ranch" and you sit there waiting for the hogs (or whatever game) to come feed at the feed spreader box. These photos are from the Piloncillo Ranch where I worked on an oil project until recently (including the Briscoe Ranch) north of Laredo. These "hunting" boxes and feeders are everywhere. Even seen them in West Texas around Midland. I never "hunted" like that but it seems strange to pay for what I would call a "canned hunt". But to each his own. I saw another thread on here... I was hoping not to pay a lot for a hunt. Maybe instead to just shoot some to help some farmers out. Last edited by hairygreek; October 16, 2018 at 13:44. Last edited by Texgunner; October 16, 2018 at 20:38. The only free hog hunts you'll find are those on private land where you know the owner and he/she asks you to hunt. Unless you know somebody everywhere else is going to cost money. Trust me on that; I've lived here my whole life. With that said, you can get out on state land and you'll probably kill a hog or two. But finding them might be an issue since hogs like to roam and are actually fairly intelligent creatures when it comes to avoiding you. In order to hunt hogs here, all you'll need is an out of state license. 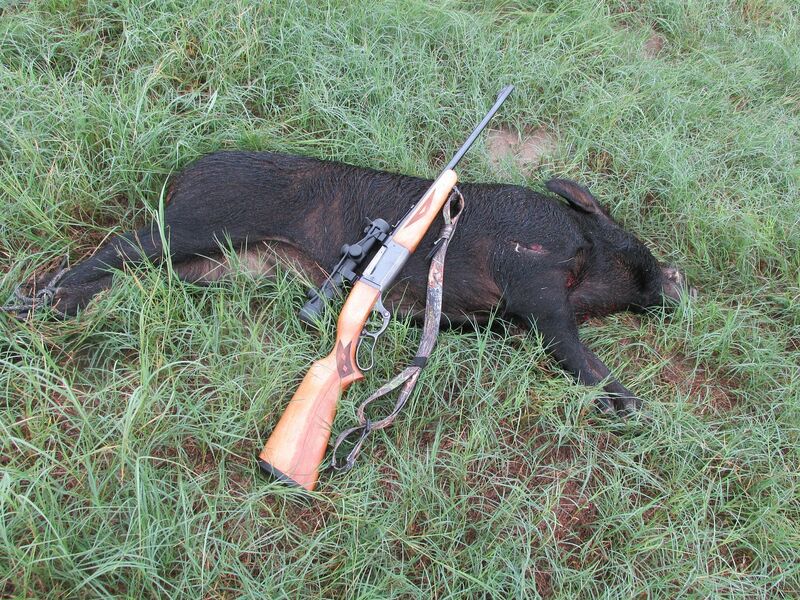 Hogs in Texas have no closed season and no restrictions on the method used to take them. People here shoot them, shoot them from helicopters, spear them, run them down with dogs and cut their throats, and hell, a few assholes just blow them up. The hogs are overrunning our wild places so if you can figure out how to get over here and kill a few, please do. Chance favors the prepared mind. that know neither victory, nor defeat. Pray for peace, but prepare for war. I'm amazed that people actually like hunting those nasty things. I shoot one every couple of years, that's it. The Wyoming guys I hunt with are always talking about how cool it would be to come to Texas and shoot a hog. I just shake my head and tell them that they have it way better up there. Yeah, I prefer muleys, pronhorn and elk hunting, as well as some birds. I shot this porcine gentleman around 4:00 this afternoon. He was 50 yards away from my box blind, directly under the feeder when I shot and he fell. I used a 1966 Savage 99E in .308 with Federal Power-Shok 180 gr. SPs. The first shot was just under and behind his left ear. I believe that killed him. Some evidence of that can be seen here. The other two wounds were just to make sure he didn't get up. Having just ate some fresh boar sausage... I can attest to their deliciousness. They are ugly, kind of like shooting giant rats. We had free Hog Hunting in TN for a bit, then politicians decided it was too much fun. I shot this porcine gentleman around 4:00 this afternoon. So after you've shot him, what next? Gut like a deer and haul him off the butchers? What'd he weigh? How much edible meat do you walk away with? The butcher do your sausages? Normally nobody eats these things. Even the more carnivorous types will only butcher a young sow. Wild Hogs have worms and parasites galore. Do feral hogs carry disease? 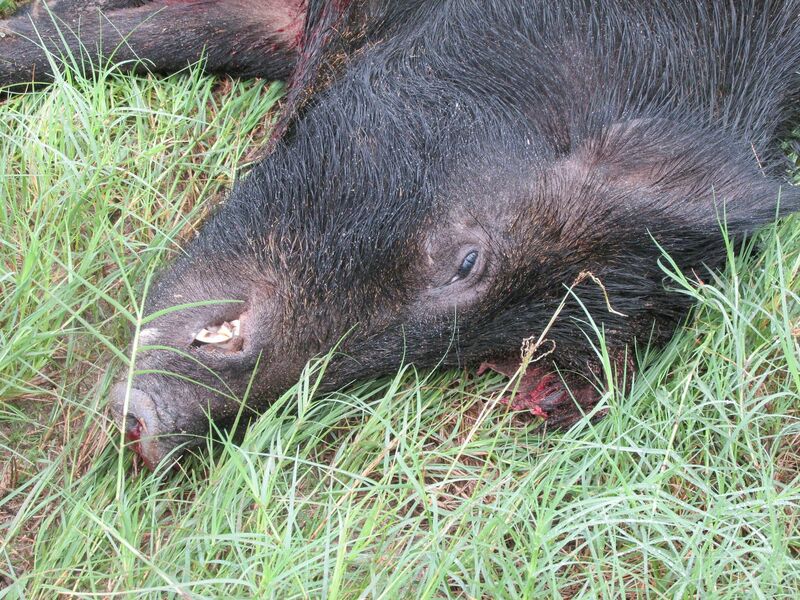 In general, diseases from wild hogs do not pose a significant threat to humans; however, some diseases can be transmitted to livestock and wildlife. It is important to keep all livestock vaccinated, especially where large feral hog populations are concentrated. Various diseases of wild hogs include pseudorabies, swine brucellosis, tuberculosis, bubonic plague, tularemia, hog cholera, foot and mouth disease, and anthrax. Internal parasites include kidney worms, stomach worms, round worms and whipworms. Liver flukes and trichinosis are also found in hogs. External parasites include dog ticks, fleas and hog lice. What is pseudorabies and swine brucellosis? Pseudorabies, also known as "mad itch" is a swine herpes virus that may affect the respiratory, nervous and reproductive systems. Despite its name, it is not a rabies type disease but derives its name from the symptoms similar to a rabid animal. It is transmitted primarily through breeding but may also to be transmitted through respiratory secretions of the infected animal. Infected adult swine typically develop flu-like symptoms whereas young pigs can have severe respiratory and digestive symptoms and ultimately die. Pseudorabies poses no threat to humans but may be fatal to domestic livestock and pets. Swine Brucellosis is an infectious, bacterial, reproductive disease that can cause miscarriage, low conception rates, and other problems. It is transmittable to humans, known as undulant fever, and causes flu-like symptoms such as fever, chills, aches and pains. It is treatable with specific antibiotics. How do I keep from contracting diseases? Texas Parks and Wildlife Department recommends all hunters use disposable plastic or rubber gloves when field dressing or cleaning wild swine. Bury or burn the gloves and entrails and then wash your hands with soap and hot water. And finally, make sure the meat is thoroughly cooked. Is the meat good to eat? Yes, meat from feral hogs is extremely tasty and much leaner than penraised pork. The meat from older boars may be tougher and rank tasting if not prepared adequately. As with all pork, care should be taken and the meat well cooked. Otherwise, it should be prepared just like market hogs. The slower the meat is cooked, the more tender and tasty it becomes. Yep Story you’re right. Texas .gov says it’s delicious then so be it. I ain’t eating one. Pink type piggy meat up the road at the butcher shop. Very few parts of one of a hog I eat. I don't gut the,. I skin back far enough to get the backstrap and hams, that's it. Coyotes and buzzards get the rest. And yes it tastes better than store bought pork....to me anyway. No, I didn't want him and left him there. He will be recycled within 48 hours I'm sure. What did he weigh? Not that much, maybe 180? Just guessing really. They are damaging my land and spooking the deer. My pasture is now leased to a guy who kills pigs at night with a .300 Blackout AR with thermal imaging. Last winter, he and a partner shot more than 500 of them. They sell them to a company that makes dog food. Maybe, he'll thin them out a little on my place too. I’ve wanted to do some wild hog hunting for some time but the more I looked into going to somewhere like Texas and how much people are charging, I’ve decided it’s not worth the money. I could buy a lot of bacon and ham for the price they want to come kill some hogs. Now hunting from a helicopter, that I might be willing to pay for as that would be a lot of fun. A few years back there was a guy here in Utah that brought in some feral hogs to start a hog hunting operation. 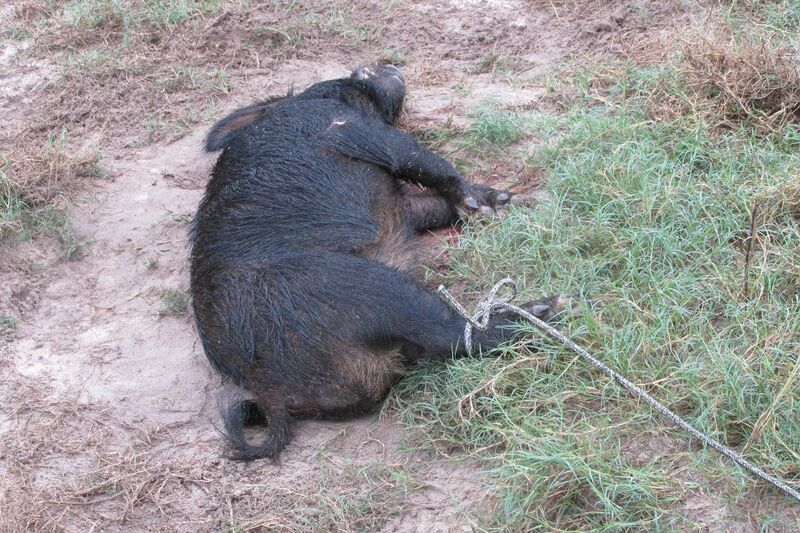 When the state wildlife division caught wind of it they came in and made the owner kill all of the hogs. There have been a few reports of feral hogs in the eastern part of the state down by the four corners area. The video of the guy shooting hogs from the stand was pretty cool. He is an amazing shot too. Ain't that cool? That young man is a hell of a shooter for sure. I'd say he's spent a fair amount of coin and time developing those skills! Skin, gut, and slow smoke it on a spit. Makes for some of the leanest, most flavorful meat you'll ever eat, and the breakfast tacos from a smoked pig are the $#!+. My uncle has about 1000ac south of Houston in Port Lavaca. They run cattle instead of raising corn or cotton like most of their neighbors do, so their place is where the pigs hide. Brother and I stalk hunt their hide areas, and is a hell of a good time. We started with ARs, but soon realized security-type auto shotguns (big capacities and short barrels) are the best tools for the job since most shots are 30 yards or less, and they travel in groups. Nothing says fun like wandering up on a group and emptying the gun of #4 buckshot. Like quail hunting but a lot more satisfying, knowing that you're helping out farmers and protecting their livelihoods. Free meals included! Thanks for that information Brother Story. I've eaten wild hawg before and it was delicious every time. Your report is an eye-opener. It is probably the reason me of why The Old Testament states not to eat hogs before the days of proper handling and cooking techniques. Last week some unfortunate soul hit a hog on the Farm Market road that runs between my house and town. I first saw the carcass from the rear in the ditch and I thought it was a bear. After I passed by I could determine it was a hog, a really big hog like 300 lbs. +. I hate to think of the damage on the vehicle unlucky enough to hit it. By the next day it was gone and the buzzards were lounging around where it had been. I haven't seen any live ones yet but I'm sure they are out there. I've eaten several wild hogs myself. I always wear gloves when I process them and you really want to make sure the meat is cooked before you eat it. But otherwise, no worries. They're not really any different than dressing any other large wild game. The trick to getting wild hog meat with a good flavor, IMHO, is to shoot a younger pig, preferably a sow, weighing less that 150lbs or so and the younger/smaller the better. Most of those that I processed and ate weighed less than 60lbs. Big boars really aren't meant to eat. They stink and their funk carries through to the meat. Young sows are better table fare in my experience. And plus, every sow you kill is one less sow popping out piglets every few months. Nothing says fun like wandering up on a group and emptying the gun of #4 buckshot. Dayum, rat killin on a "magnum" scale! First rule of gun fighting: "have a gun!" "Guns don't kill people. Daddys with good looking daughters do!" All times are GMT -5. The time now is 01:01.